Hupy and Abraham Supports ABATE | Hupy and Abraham, S.C.
ABATE is an organization that exists to give motorcyclists a voice about their safety, their legal rights, and their way of life. It is an organization that Hupy and Abraham actively supports. Below is a sampling of the work we did with ABATE from 2003 – 2009. Accident Scene Management, Inc. (ASMI) is a 501 (c) (3) corporation which teaches motorcyclists what to do at the scene of an accident. On January 28, 2006, ASMI Director Vicki Roberts-Sanfelipo recognized the top three financial supporters of the program. Miller Brewing donated $3,500.00 and received the Associates Award; ABATE of Wisconsin donated $5,500.00 and received the Bronze Award; Hupy and Abraham donated $25,000 and received the Silver Award. Hupy and Abraham will certainly be the first recipient of the Gold Award in 2006, which is a donation over $25,000. In addition to donations at the Silver level, Hupy and Abraham also has paid $10.00 of the registration fee of nearly every student in Wisconsin, Illinois, Iowa, Michigan and Minnesota since the inception of the program. On January 24, 2006, Attorney Michael Hupy and accident investigator and ABATE of Wisconsin Founder, Tony “Pan” Sanfelipo, traveled to Madison, Wisconsin to participate in ABATE’s lobby day. The purpose of the lobby effort was to enlist support for SB528, the Roadway Users Responsibility Act. There are eighteen sections to this bill. Most notably the bill imposes stricter penalties for right of way violations and also allows motorcyclists to proceed through a red light at sensor actuated stop lights. Attorney Hupy and Sanfelipo are Life Members of ABATE of Wisconsin, and joined other ABATE members in speaking to a large contingency of lawmakers. The group, coordinated by ABATE’s Legislative Director, Dave Dwyer, had interesting and informative talks with both Senators and Representatives and even persuaded several more to sign on as co-sponsors of the bill. ABATE of Wisconsin Executive Director, Ed Williams, called the day a success and appreciated everyone’s efforts. Just one week after a successful lobby day in Madison promoting SB528, the Road Users Responsibility Act, a public hearing was scheduled before the Wisconsin Senate Judiciary, Corrections and Privacy Committee. On February 1, 2006, the committee members heard testimony from (in order of speaking) Tony “Pan” Sanfelipo, Accident Investigator for Hupy and Abraham and Founder of ABATE of Wisconsin; Attorney Michael F. Hupy; Kirk “Hardtail” Willard, Vice-President MRF and Deputy Director of ABATE of Wisconsin; Dave Dwyer, Legislative Chairman of ABATE of Wisconsin. Each speaker offered testimony on a different aspect of the bill. Sanfelipo explained the right of way violation section and how it provided for stiffer penalties and longer suspension of driver’s license for violators. Attorney Hupy talked about the problems caused by stop lights that are not calibrated to sense motorcycles and how the bill would allow motorcyclists to proceed through a red light safely under those circumstances. Willard explained remedial driver education classes and the need for motorcycle awareness in these classes. He also explained the Share the Road program presented by ABATE of Wisconsin and how that should be a part of education for right of way violators. Dwyer spoke about current law on obtaining a motorcycle operators license, and how a waiver should work for those completing and passing a basic riders course and not be required to apply for an instruction permit. He also explained roadway hazards created in so-called highway improvement plans. The problem is motorcycles are not considered when making those plans. After some comments by several committee members, the ABATE group assembled back in Senator Zien’s office to work on some subtle language changes in the bill. The Hupy Law Firm is a major financial sponsor of the Northern Chapter of A.B.A.T.E. Of Illinois annual Barnyard Boogie and Poker Run at Hidden Lake Stables. Vendors, raffles, live music, free camping, food and drink, bike show, poker run and motorcycle rodeo round out this weekend of fun. Attorney Michael Hupy accepted an invitation to speak at the Barnyard Boogie again this year. check in the amount of $5,000.00 for the MRF Awareness and Education Fund. At the Meeting of the Minds this past September in Denver, Colorado, it was brought to the attention of attendees that the MRF was going through some tough financial times. In order to continue providing quality conferences and workshops as well as maintaining the top notch office and lobby efforts in Washington, D.C., there needs to be further financial commitment from the motorcycle community. Attorney Michael F. Hupy was invited to speak at the ABATE of Wisconsin annual meeting in Wisconsin Rapids on October 12th. Hupy presented a personal check in the amount of $5,000.00 to MRF President Kirk “Hardtail” Willard to help with the organization’s current economic situation. Two years ago Hupy suggested a Planned Giving Program for the MRF, which has now been put in place as the MRF A & E Fund to which he donated the first $5,000.00. In making his donation, Attorney Hupy challenged other lawyers who have rider clients to match his donation or at least give $1,000.00 to the MRF. It is imperative that the MRF be allowed to continue its work. This organization does not receive large corporate or business donations but instead relies on the generosity of the very people it represents and who benefit from its endeavors. The Hupy Law Firm made a $1,000 donation to allow the first 50 attendees to gain free admission to the South Suburban Chapter of A.B.A.T.E. of Illinois’ 19th Annual Helment Roast. Attorney Hupy has been a member of South Suburban Chapter of A.B.A.T.E. of Illinois for the past 10 years. Bob Sumption is president of the Embarras Valley Chapter of A.B.A.T.E. of Illinois, and former Mayor of Newman, IL. He has been riding for over 20 years and has been a member of A.B.A.T.E. of Illinois for 12 years. He recently took a job as an investigator with our firm. Bob works out of our Bloomington/Normal office. Attorney Michael F. Hupy was invited by the A.B.A.T.E. of Illinois Board of Directors to speak at the monthly Board Meeting held on August 21, 2004, in Springfield, Illinois. Hupy spoke about riders’ rights, how the firm's television advertising promotes awareness of A.B.A.T.E. of Illinois, the availability of his firm to provide services to riders in Illinois and Wisconsin, and the importance of riders having as much information as possible so that they have true freedom of choice when it comes to choosing an attorney. On the same day, Hupy's partner, Jason F. Abraham, and Tony Sanfelipo, Investigator with the Hupy firm and founder of ABATE of Wisconsin, spoke at an event sponsored by the Northern Illinois chapter of A.B.A.T.E. of Illinois and Chapter President, Paula White. Abraham spoke about the free speech rights at stake in the Outlaws Milwaukee Motorcycle Club v. Summerfest case, a hazard recently caused to motorcyclist when someone stretched plastic wrap across a roadway in Waukesha County, and the helmet bill signed by Governor Jim Doyle on March 15, 2004, which prevents insurance companies from reducing awards to injured riders who are not wearing helmets. When A.B.A.T.E. of Illinois and motorcycle club members had a problem in Dwight, Illinois, in September of 2004, claiming that they had been harassed by law enforcement officers, based on a "no colors" policy in Dwight, they had difficulty finding an attorney who was willing to help them. Linda McNulty, a resident of Dwight, Illinois, and manager of the RonDeVoo tavern, took it upon herself to get help with what she saw as an unconstitutional violation of the rights of riders traveling through Dwight. 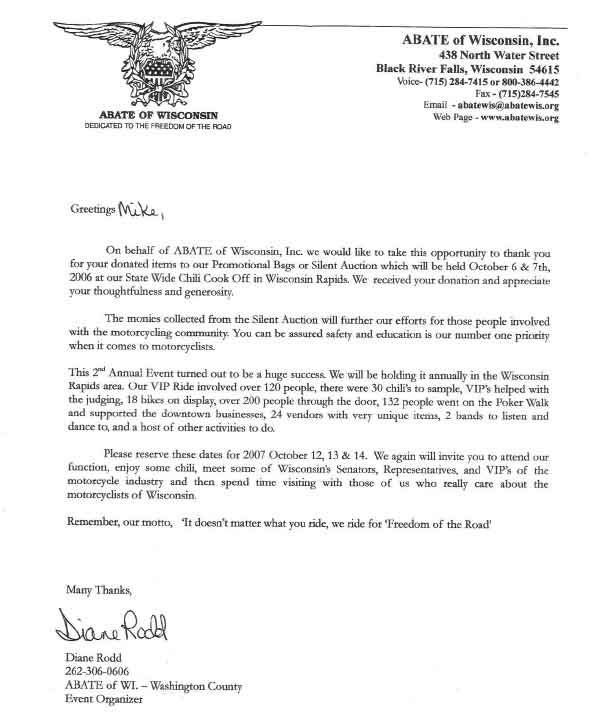 Linda found what she called a “fantastic letter written on behalf of the Outlaws M/C by Attorney Michael F. Hupy to the Mayor of Milwaukee.” This was copied and distributed to riders in Dwight. Linda was familiar with Attorney Michael F. Hupy because he successfully settled her motorcycle accident case in 1993. 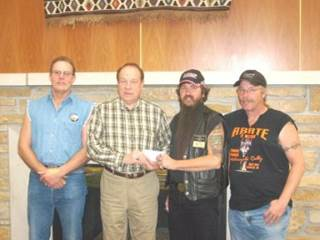 Michael F. Hupy agreed to meet with members of four motorcycle clubs on September 13th in Dwight, Illinois. Later that evening, they all met with the Police Chief and attended the Village Board meeting. The Police Chief assured everyone that nobody would be discriminated against for wearing colors, and Hupy presented educational material to the Board about club insignias. Bob Sumption, President of the Embarrass Valley Chapter of A.B.A.T.E. of Illinois and accident investigator with the law firm of Michael F. Hupy & Associates, attended a follow-up meeting in Dwight. There were no reported problems with riders wearing colors during the annual Harvest Days event in Dwight. ABATE of Wisconsin called for its members to come to Madison to lobby for specific motorcycle issues on the legislative agenda. Dozens of members and officers gathered on April 6, 2005, to discuss strategies on presenting their concerns to lawmakers. The group also had an opportunity to meet and talk to ABATE’s newest Public Relations Officer, David “Chubby” Charlebois. Senator Zien held a strategy meeting in his office in Madison, Wisconsin, attended by Kirk “Hardtail” Willard, Deputy Director of ABATE of Wisconsin and Vice-President of the MRF, Dave Dwye, ABATE of Wisconsin’s Legislative Director, Attorney Michael Hupy, and ABATE of Wisconsin Founder, Tony “Pan” Sanfelipo. Attorney Hupy gave his insight on some of the legal aspects of the bill language, as well as speaking to many legislators and their staffs during the day’s lobby effort. Hupy was an integral part of the team that successfully overturned a Wisconsin Supreme Court decision on injured riders who were not wearing a helmet. Also attending was ABATE of Wisconsin Founder, Tony “Pan” Sanfelipo. As a motorcycle accident investigator for the Hupy Law Firm, Pan deals with victims of Right of Way Violations every day. The Roadway Users Responsibility Act covers certain initiatives ABATE wants considered, including; allowing motorcycles to proceed with caution through a red light when sensors do not detect the motorcycle; a review of current right of way violations; and increased penalties if severe injury or death results from the violation of the motorcyclist's right of way. Tony "Pan" Sanfelipo, and Jonathan Green, host of WTMJ radio's "The Green House"
listen to opening comments at the meeting. 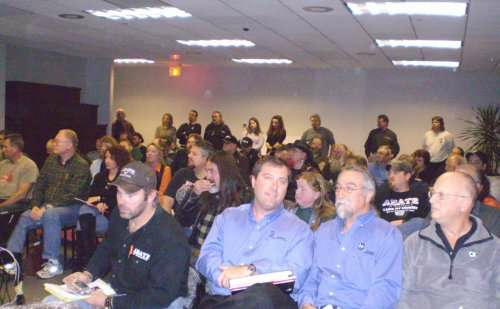 On November 14, 2006, Hupy and Abraham hosted a special meeting on road conditions for ABATE of Wisconsin, Region 1A. This meeting attracted over 75 riders from southeastern Wisconsin and Northern Illinois. The meeting was organized to address certain concerns area motorcyclists have about road conditions in Wisconsin. Of particular interest are the practices of road crews in putting down large metal plates, cold tar patches and leaving loose gravel on the road surface. These and other conditions were discussed in length, aided by a power point presentation created by Tony "Pan" Sanfelipo, ABATE Founder and accident investigator for Hupy and Abraham. There was an earnest promise to discuss our concerns further with the DOT and some suggestions have already come back from those offices. ABATE intends to continue these discussions at other regional offices of the DOT throughout the state in 2007. Hopefully, together we can remedy some dangerous situations and find alternatives to common repair practices that pose a hidden danger to cyclists. Hupy Accident Investigator, Tony "Pan" Sanfelipo, and ABATE Public Relations Officer, Dave "Chubby" Charlebois, have offered to travel to the various regions in the state and act as facilitators for the upcoming meetings. Hupy and Abraham was happy to host this first, important meeting. The law firm provided free parking as well as food and beverages for all in attendance. Recently, the organizers of the Illinois Motorcycle Freedom Run and A.B.A.T.E. of Illinois members called on Hupy and Abraham to assist in working with the City of Marseilles to make sure this wonderful event can continue to take place annually. Hupy and Abraham Attorney Pete Naylor, a member of two A.B.A.T.E. of Illinois chapters, is providing pro bono representation to the Illinois Motorcycle Freedom Run. There was growing concern that the City of Marseilles would not issue a special event permit, required to have the Illinois Freedom Run in their city, because of security concerns. The application for the permit was tabled at least once by the City Council, and just three weeks before the event, the permit had not yet been issued. Hupy and Abraham through conversations with the City Attorney, Rich Burton, was able to help ensure that the special use permit would be issued. After many conversations, the special use permit was issued on June 4th at the City Council Meeting. Pete Naylor, was in attendance and spoke at the meeting. Hupy and Abraham continues to provide pro bono assistance to the Illinois Motorcycle Freedom Run on many issues that still need to be negotiated with respect to the Illinois Motorcycle Freedom Run and the Middle East Conflicts Wall Memorial, and is confident that this event will take place for years to come. We are proud of our affiliation with ABATE of Wisconsin and A.B.A.T.E of Illinois and we will continue to supports the organizations as they continue to support the riders in our area.